Traditionally, every week we bring you a list of the top performances of Australians who are currently playing abroad. #1. This week's number one is former international point guard Ben Simmons (208-96, college: LSU, currently plays in NBA). Simmons was the major contributor in a Philadelphia 76ers' victory against the Minnesota Timberwolves (34-42) 118-109 in the NBA last Saturday. He recorded a double-double by scoring 20 points and getting 11 rebounds. Simmons also added 9 assists; quite an impressive performance considering it's only his third season in pro basketball. The Philadelphia 76ers have a solid 49-27 record this season. Simmons has individually a very good year with high stats. He averages: 17.1ppg, 9.0rpg, 7.8apg, 1.4spg, 2FGP: 57.3%(513-896) and FT: 60.3%. Simmons played for the Australian senior national team five years ago. #2. Second place goes to former U19 international power forward Jonah Bolden (208-96, college: UCLA, currently plays in NBA) is a teammate of previously mentioned Ben Simmons and both played together in the last NBA game. Bolden led Philadelphia 76ers to a victory against the Minnesota Timberwolves (34-42) 118-109. He scored 19 points, grabbed 8 boards, handed out 3 passes and blocked 3 shots in 31 minutes; not bad, considering it's only Bolden's second season in pro basketball. It's Bolden's first year with the team. This season his overall stats are: 4.5ppg, 3.5rpg, 2FGP: 72.2%(39-54), 3FGP: 37.2% and FT: 47.6% in 39 games he played so far. Bolden played for the Australian U19 national team in 2013. #3. The Australian player who performed third best last week abroad was an international power forward Mangok Mathiang (208-92, college: Louisville, currently plays in Italy). He contributed to a Vanoli Cremona's victory against the league leader Armani Milano (19-5) 76-72 in the Italian Serie A in Sunday night's game. Mathiang recorded a double-double by scoring 12 points and getting 13 rebounds. It was the game of the round between two top 4 ranked teams. Vanoli Basket Cremona (15-9) is placed third in the Serie A. Mathiang has relatively good stats this season: 10.1ppg, 9.5rpg, 2FGP: 60.7%(108-178) and FT: 49.1%. He has a dual citizenship: Australian and South Sudanese. Mathiang is also a member of the Australian senior national team. #4. Small forward Joe Ingles (203-87, currently plays in NBA) helped Utah Jazz win their game against the Washington Wizards (32-46) 128-124 in the NBA last Friday. He had a double-double by scoring 18 points and making 10 passes. Ingles also added 5 rebounds in 36 minutes. The Utah Jazz has a solid 46-30 record this season. It was his team's fourth consecutive victory in a row. Ingles is one of the most experienced players in a team as it's his fifth year in Utah Jazz's roster. He has very impressive stats this season: 11.9ppg, 4.0rpg, 5.6apg and 1.2spg in 76 games. Ingles used to play for the Australian national team back in 2016. #5. Former University international swingman Xavier Cooks (203-95, college: Winthrop, currently plays in Germany) could not help s Oliver Baskets (7-9) in their last game on Monday. Despite his very good performance s Oliver Baskets was defeated 81-70 on the road by the leading Bayern Muenchen. Cooks was the second best scorer with 15 points. He also added 5 rebounds and 5 assists. This season Cooks has relatively solid stats: 11.4ppg, 5.6rpg, 1.9apg and 1.1spg. He used to play for the Australian university national team two years ago. #6. Center Aron Baynes (208-86, college: WSU, currently plays in NBA) helped Boston Celtics edge the Indiana Pacers (45-32) 114-112 in the NBA last Friday. Baynes recorded a double-double by scoring 13 points and getting the same number of rebounds. The Boston Celtics have 45-32 record this season. Baynes' total stats this year are: 5.4ppg, 4.3rpg and 1.1apg. He is a former international player as he played for the Australian senior team three years ago. #7. International guard Nathan Sobey (190-90, college: Wyoming, currently plays in France) was not able to help SIG Strasbourg (14-10) in their last game. Despite Sobey's good performance SIG Strasbourg lost 86-92 in Nanterre to the lower-ranked (#9) JSF Nanterre. He scored 10 points and added 3 passes (went 6 for 6 at the free throw line) in 24 minutes. They ended the series of three consecutive victories. This year Sobey's total stats are: 8.3ppg, 1.5rpg and 2.3apg in four games. He is also Australian national team player. #8. Center Jock Landale (211-95, college: St.Mary's, CA, currently plays in ABA League) helped his Serbian team Partizan win their game against the league leader Crvena Zvezda (21-1) 70-67 in a derby game in the ABA League last Saturday. He scored 10 points and grabbed 8 rebounds in 26 minutes. It was the game of the round between two top 4 ranked teams. BC Partizan NiS Beograd (14-8) is placed fourth in the ABA League. It's Landale's first season with the team. Landale has reliable stats this year: 12.5ppg, 5.9rpg, 1.9apg and 1.1bpg in 24 games. He plays currently for the Australian national team. #9. International power forward Daniel Johnson (212-88, college: Pepperdine, currently plays in Japan) was not able to secure a victory for Tokyo Z (20-34) in their last game on Sunday. Despite Johnson's very good performance the fourth-placed Tokyo Z (20-34) was crushed 92-71 at home by the leading Shinshu BW in the Central group. He recorded a double-double by scoring 33 points and getting 11 rebounds. Johnson also added 4 assists and 3 steals. There are only two games left until the end of the Regular Season. So now every game will be critical. This season Johnson has very high stats. He averages: 23.5ppg, 11.6rpg, 3.6apg and 1.6spg. Johnson is also in the roster of the Australian national team. #10. Swingman Ben Madgen (193-85, college: Augusta, currently plays in Germany) helped Crailsheim Merlins edge the closely-ranked Giessen 46ers (11-15) 115-114 in the German BBL in Saturday night's game. He scored 20 points, grabbed 6 rebounds and dished 3 assists in 30 minutes. HAKRO Merlins Crailsheim (7-18) is placed 15th in the BBL. Madgen averaged so far 14.8ppg, 4.8rpg and 1.8apg in 24 games. He is a former international player as five years ago he still played for the Australian senior national team. #11. Former international forward Brock Motum (208-90, college: WSU, currently plays in Euroleague) managed to help Anadolu Efes Istanbul to win against the closely-ranked Baskonia 102-92 in the Euroleague last Friday. Motum scored only 4 points. Motum has averaged so far 6.6ppg and 1.7rpg. He used to play for the Australian national team three years ago. #12. International forward Thon Maker (216-97, currently plays in NBA) couldn't help the Detroit Pistons (39-37) in their last game. Despite Maker's good performance the Detroit Pistons lost 114-121 in Oakland to the Golden State Warriors. He scored 12 points and grabbed 6 rebounds in a mere 19 minutes. Maker has averaged so far 5.7ppg and 3.7rpg in 23 games. He is also in the roster of the Australian national team. #13. Former international point guard Patrick Mills (183-88, college: St.Mary's, CA, currently plays in NBA) helped San Antonio Spurs win their game against the Cleveland Cavaliers 116-110 in the NBA last Thursday. He scored 11 points, had 4 rebounds and dished 3 assists in 23 minutes. Mills averaged so far 9.9ppg, 2.3rpg and 3.0apg in 76 games. He used to play for the Australian national team three years ago. #14. Former U19 international center Matur Maker (208-98, currently plays in Slovenia) helped Zlatorog win their game against the leader Sentjur 81-78 in the Slovenian Liga Nova KBM on Saturday night. Maker scored 16 points, grabbed 5 rebounds and made 2 blocks. Maker's stats this season are: 12.6ppg, 8.9rpg and 1.5apg. He used to play for the Australian U19 national team back in 2016. #15. Former international point guard Joshua Wilcher (178-91, college: Cent.Wyoming, currently plays in United Kingdom) couldn't help Plymouth Raiders (11-15) in their last game. Despite Wilcher's very good performance Plymouth Raiders lost 90-98 in Manchester to the higher-ranked (#8) Giants. He had a double-double by scoring 23 points and making 10 passes. Wilcher also added 4 rebounds in 40 minutes. Wilcher has very impressive stats this year: 16.9ppg, 3.5rpg, 6.9apg and 1.3spg in 23 games. He used to play for the Australian national team ten years ago. #1. Kyrie Irving (190-G-92, college: Duke, currently plays in NBA) led Boston Celtics to a 2-point victory over the Indiana Pacers (45-32) 114-112 in the NBA in Friday night's game. He was MVP of the game. Irving recorded 30 points (!!! ), 5 assists and 3 steals (made all of his five free throws) in 35 minutes. The Boston Celtics have 45-32 record this season. Irving has individually a very good year with high stats. He averages: 23.9ppg, 5.1rpg, 7.1apg and 1.6spg in 63 games he played so far. Irving is a naturalized American. Strangely he has never played in Australia. #2. Experienced Timothy Kearney (201-F/G-86, currently plays in Sweden) led BC Lulea to a victory over the closely-ranked KFUM Jamtland (23-13) crushing them 110-80 in the Swedish Basketligan in Sunday night's game. Kearney was MVP of the game. He scored 24 points, had 8 boards, passed 3 assists and added 5 steals in 29 minutes. BC Lulea (24-12) is placed fourth in the Basketligan. Kearney has been at the team for nine years. This season Kearney's total stats are: 4.5ppg and 3.1rpg in 36 games. He has a dual citizenship: Australian and Swedish. #3. Josh Duinker (209-F/C-89, college: Richmond, currently plays in Japan) was the major contributor in a Kumamoto Volters' victory against the sixth-ranked Bambitious Nara (16-37) 75-70 in the Japanese B2 League in Saturday night's game. Duinker recorded a double-double by scoring 18 points and getting 16 rebounds. He also added 3 assists. Kumamoto Volters (39-15) are placed second in West group. It was his team's sixth consecutive victory in a row. There are only two games left until the end of the Regular Season. So now every game will be critical. This season Duinker has very high stats. He averages: 20.8ppg, 10.9rpg and 3.0apg. Duinker is another player who holds two passports: Dutch and Australian. #4. Dominic Gilbert (198-G/F-96, college: UBC, currently plays in Croatia) contributed to an easy victory against the sixth-ranked KK Vrijednosnice Osijek (10-9) crushing them 108-78 in the Croatian Premijer Liga in Monday night's game. Gilbert scored 10 points. KK Cibona VIP Zagreb (15-4) is placed first in the Premijer Liga. It was his team's third consecutive victory in a row. There are only three games left until the end of the Regular Season. So now every game is very crucial. Gilbert has averaged so far 6.6ppg and 2.8rpg. #5. Tony Tolovae (196-G-92, currently plays in Norway) was the main contributor in a Gimle BBK's victory against the closely-ranked Baerum Basket (21-6) 88-75 in the Norwegian BLNO last Wednesday. Tolovae was MVP of the game. He scored 29 points (!!!) and grabbed 8 rebounds in 36 minutes. It was the game of the round between two top 4 ranked teams. Gimle BBK Bergen (22-5) is placed second in the BLNO. It was his team's fourth consecutive victory in a row. Tolovae has very impressive stats this year: 16.6ppg, 5.0rpg, 2.9apg and 1.9spg in 28 games. He has both Australian and New Zealand nationalities. #6. Joseph Lual Acuil (213-F-94, college: Baylor, currently plays in Israel) contributed to H.Galilee's victory against the eighth-ranked Elitzur Yavne 90-78 in the Israeli National League (second division) in Tuesday night's game. Lual Acuil was MVP of the game. He had a double-double by scoring 26 points and getting 11 rebounds in 30 minutes. Lual Acuil has very impressive stats this year: 20.1ppg, 9.4rpg, 1.1apg and 1.7bpg in seven games. He also holds two passports: Australian and Sudanese. #7. Rasmus Bach (193-G, college: Fort Lewis, currently plays in Denmark) contributed to Randers' victory against the fourth-ranked Svendborg 95-88 in the Danish BasketLigaen on Monday night. Bach scored 7 points and grabbed 5 rebounds. Bach averaged so far 10.2ppg, 3.7rpg, 1.7apg and 1.5spg. He has Australian and Danish nationalities. #8. Deng Adel (201-F-97, college: Louisville, currently plays in NBA). Adel could not help the Cleveland Cavaliers to beat the Los Angeles Clippers. He cannot count Saturday's game as one of the best ones. Adel scored only 2 points in 4 minutes on the court. His team were crushed by 24 points 132-108 in the NBA. Adel has averaged so far 1.8ppg and 1.1rpg in 15 games. He has dual citizenship: South Sudanese and Australian. #9. Obi Kyei (206-F-94, agency: Two Points, college: Eckerd, currently plays in Spain) contributed to an Lleida Basquet's victory against the closely-ranked Castello 88-82 in the Spanish LEB Gold (second division) last Friday. Kyei scored 10 points. Kyei has averaged so far 8.3ppg and 4.1rpg. He holds both British and Australian passports. #10. Adam Thosby (198-G/F-91, agency: Players Group, college: Georgia SW, currently plays in United Kingdom) was not able to help Worcester Wolves (4-21) in their last game. Despite his good performance the bottom-ranked Worcester Wolves was edged 96-93 on the road by the higher-ranked (#7) Newcastle Eagles. Thosby scored 10 points and grabbed 5 rebounds (went 5 for 5 at the free throw line) in 23 minutes. Thosby averaged so far 11.0ppg, 3.2rpg and 1.8apg in 25 games. He has Australian and British nationalities. 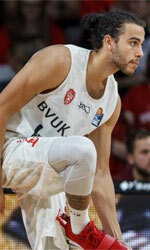 Worth to mention Thosby played also at Eurobasket Summer League, which helped him get the job in pro basketball.